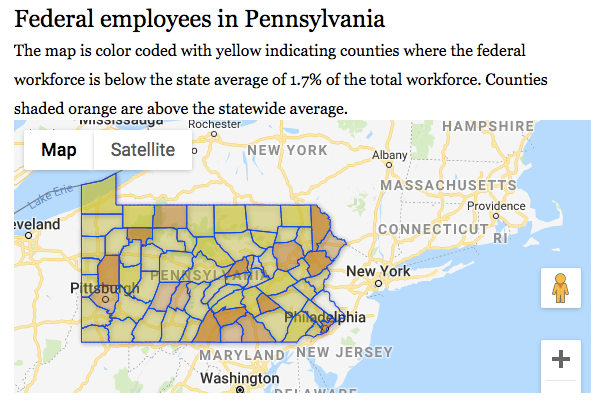 The Morning Call: Map: See where federal workers in Pennsylvania live, what they earn without a shutdown - An interesting map to consider. How might it be improved? Map Music Mapped - Celebrity Cruises created a map of the U.S. and U.K. top hits mentioning cities from 1960 onward. The top city is New York. I'm reading a biography of Paul Simon, so I confirmed that The Boxer was there ("where the New York City winters aren't bleeding me, leading me, going home.") Forbes contributor Duncan Madden wrote about the map very likely based on this press release from two days earlier. The map debuted in November 2018. OGC Tutorial: This text-based tutorial covers OGC and its standards using text and a few images. It's from 2017. Press Release: Age of Learning Brings the Largest Collection of National Geographic Kids Digital Books Available Anywhere to Online Library ReadingIQ - Apparently the collection is free to use in the classroom, but requires a subscription for home use. Slavery from Space: The crowdsourcing effort is under development. The ask: "Help us to locate modern slavery from space and meet the UN Sustainable Development Goal to end it by 2030." Fundamentals of Data Visualization: There's an online preview of the soon to be published (O'Reilly) book by Claus O. Wilke. Spatial Data Science: Edzer Pebesma and Roger Bivand share the first eight chapters and the outline of their book and request comments. Via Steven Ramage. Education Week: State Grades on Chance for Success: 2019 Map and Rankings - My state did very well: A-. See 2018 map here. WBAL: Baltimore City Schools Use New Map Features to Address Building Concerns - "According to administrators, they hope this will help the district do a better job of keeping old buildings warm." You can check out the app here. When I visited two schools were closed due to facilities issues! Yikes! Via my colleagues at Esri. Jason Armstrong Baker is a musician who uses music to teach about geography. I learned of his work a few years ago when his work cross my desk and ran in this newsletter. Here's the latest from Jason: His drumming protocol will be used in a study at Johns Hopkins examining the impact of group drumming on people with Parkinson’s and Huntington’s disease. 4H: 2019 Pillar Winners - Clyde Van Dyke won in the STEM category. What did he do? He made a map that "visualizes the drug overdose epidemic in New York, charting the increase in drug overdose deaths from 2008 to 2016 along with the potential factors that contribute to this growing epidemic. Van Dyke showcased this map at the Esri International Conference and routinely teaches workshops to educate others to use geospatial mapping to enact community change. He hopes this map motivates others to make a change." National Geographic Blog: Meet the 2019 National Geographic Education Fellows - I know one personally, Anita Palmer. Valley Morning Star: TSTC agricultural program introduces drone technology - Texas State Technical college's program now has five drones which are used in a variety of courses. "Two new drone-focused classes will be introduced in coming semesters. Introduction to Geographic Information Systems (GIS) will be available in Fall 2019, followed by GIS Applications in Spring 2020." UCSB: Eyes in the Sky - National Geographic and Microsoft are giving an AI for Earth Innovation grant to UC Santa Barbara ecohydrologist Kelly Caylor and a team with representatives from King Abdullah University of Science and Technology in Saudi Arabia and Clark University in Massachusetts. The work is "a new chapter in the global effort to adapt to a rapidly changing Earth." Concordia University (Canada): A new study shows that wine experts differ by geographic region - "Concordia researcher Bianca Grohmann found that geographic location is a factor affecting how Canadian wine experts rate quality, as well as some of wine’s sensory attributes — things like balance and acidity." DePaul Map of the Month - January 2019: Homicides in Chicago and Service Areas of Level 1 Trauma Centers - Sam Tomko-Jones mapped density of homicides in Chicago through 2017 and the service areas of Level 1 Trauma Centers. University of Toronto: Stranded without transit? U of T researchers say one million urban Canadians suffer from 'transport poverty' - That makes finding and keeping a job quite difficult. Geoawesomeness: Calling Geo-Researchers: Help Us by Blogging Your Work! - The publication invites researchers to share their work. AAG: The AAG-GTU Student Travel Awards provide travel subsidies of $200 to help undergraduate and graduate student members of GTU attend AAG meetings. Deadline: February 1st. Esri (GeoNet): New Certification Exam Delivery Options: Esri technical certification exams will be available securely from an office or home workspace. "Online Proctored, offered by Pearson VUE, eliminates the need to travel to a physical test center." SDGAcademy: Environmental Security and Sustaining Peace - "This 8-week course... provides an in-depth introduction to the multiple roles that natural resources and the environment play in the onset, escalation, and resolution of, and recovery from, violent conflicts." "It uses the MapX GIS platform (https://www.mapx.org/), which students get access to and use for case studies and exercises. It also features modules on "Spatial Planning and Recovery" and many case studies, such as "Extractives and Peacebuilding in Afghanistan" and "Diamonds, Timber and Conflict in Liberia". Any undergrad at @UTKGeography who wants to make some quick $$ and plays Pokemon Go - I need some GPS work done! Email me! This is a resume booster/professional job thing!